When you enter a large commercial building, like a mall or office complex, one of the first things you notice and experience is whether or not the air conditioning is working. If it’s not, everyone notices. With over 25 years providing commercial air conditioning services in the Perth, WA area, we can help make sure that doesn’t happen to your business or complex. From start to finish to maintenance, FreeFlow air has you covered. Still in the construction and design phase? We offer full design services for your HVAC system. On all designs, we work with a compliant team of experienced and exceptional engineers to help design commercial airconditioning solutions perfect for your project. When you work with our team, you can also rest assured, knowing that our over 25 years of experience and our adherence to the Occupational Health, Safety & Environmental specialists requirements means your system will not only function properly, but with the utmost quality, providing a safe and healthy-air environment. If you need a qualified and trustworthy team to help conceptualize, design and engineer the best and healthiest HVAC solutions for your building or complex in progress, call in FreeFlow Air Conditioning. 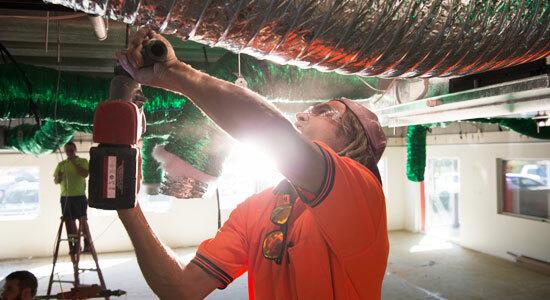 Whether you’ve been working with us through the design phase, or you’re simply ready to install a new commercial air conditioning system, FreeFlow is your HVAC installation expert in Perth. We work with and are experienced in installation of a wide array of products and brands. Our partners include Daikin, Mitsubishi Electric, Bonaire and Actron Air—all top quality brands in heating and air conditioning. When we do your install, you can know that you are getting the very best that the HVAC industry has to offer and that we do it right the first time. At FreeFlow Air, we don’t just set you up. We help you establish a regular maintenance program for your HVAC system. Saving money: It is cheaper to maintain an HVAC system and prevent major damage and wear from developing than it is to replace it. Maintenance helps your system last longer and need less serious repairs, both of which are always ideal and save money over time. Saving energy: A well-maintained system operates more efficiently and uses less energy saving you money on your energy bills. OH & S Requirements: Many are now aware that poor quality air inside buildings contributes to poor working conditions and increased illness and risk of illness. Regular maintenance of your HVAC system ensures that the air quality in your building / complex stays at the best possible level, keeping everyone in the building healthier and happier. We know how to properly assess your commercial air conditioning’s maintenance needs so that we can establish the best maintenance plan that will keep your staff and clients comfortable, healthy, and happy, while still protecting your bottom line. At FreeFlow Air, we bring over 25 years of experience and expertise, top engineers, top technicians and top-quality partners to the table to serve your needs. 24/7 Breakdown Assistance: Especially for a commercial property, it is vital your HVAC unit doesn’t have down time. Of course, there’s no controlling when an issue may strike. That’s why we offer 24/7 breakdown assistance. If your system goes down in the middle of the night, on the weekend or a holiday, you can rest easy knowing that we’re just a phone call away. With an average repair time of just 6 hours from the moment of a phone call to the completion of the repair, your staff and/or customers won’t have to notice a thing. Fast Turn-Around-Time: We pride ourselves in offering fast service to minimize any discomfort and inconvenience. Assessing your system to discover the problem and performing repairs only takes an average of 2.5 hours. Not only are we fast on the job, but from the time you give us a call and we take the job, until the time of finished repair usually only takes about 6 hours. No waiting days for us to get to you. 12 Month Warranty: At FreeFlow Air, we also offer a 12-month installation warranty that protects your investment. If any noisy vents, annoying and excessive vibrations, refrigerant gas leaks, or drain leaks develop, we’ll come out and fix it up free of charge. If you’re ready for a new HVAC system, need repairs, or even need a system designed, give us a call at 1300-668-790 or complete the form on the right to request your free online quote.